We hear this all the time in the news, but do we really know what this involves? 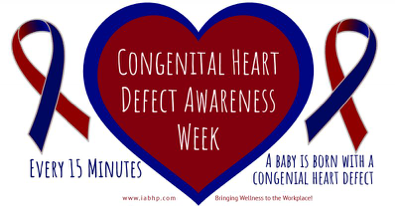 Congenital Heart Defect is the most common defect in the United States. This affects approximately one in 100 births. The good news is, because of medical advances, most children born with CHD get to celebrate their 18th birthday! So, what is CHD? This happens when the heart or the blood vessels near the heart do not develop normally before birth. Some of these defects are hard to detect before birth and sometimes even harder after birth. Some children exhibit low blood pressure, poor breathing, or they turn blue after birth. This is a good indicator. There is no known cause, but suspicions of genes and environmental factors have been presumed. A routine checkup with your doctors is critical; and, for the most part, your cardiologist may suggest an EKG or ECG (Electrocardiogram). A family history is also a great way to rule out CHD. If the initial tests do not yield good results, the cardiologist may send you for more tests such as MRI’s or even an angiography. Programs for proper screening have been put in place and this will help improve the quality of lives. In addition, CDC (Centers for Disease Control) provides funding for research. During the week of February 7-14, communities come together to educate others and ensure that they understand how common birth defects are. This is sponsored by the American Heart Association. They also take the time to honor those caretakers that are always the unsung heroes in this journey. In addition, they advocate the need for research and proper access to good quality care. Thanks to social media, many people can share their stories with others around the world. With the help of Pediatric Congenital Heart Association programs, parents, physicians, and lawmakers are drawn in to create awareness regarding CHD. You can participate during this week by wearing the awareness colors Red and Blue.